Auctioneering is about so much more than just swinging a gavel. 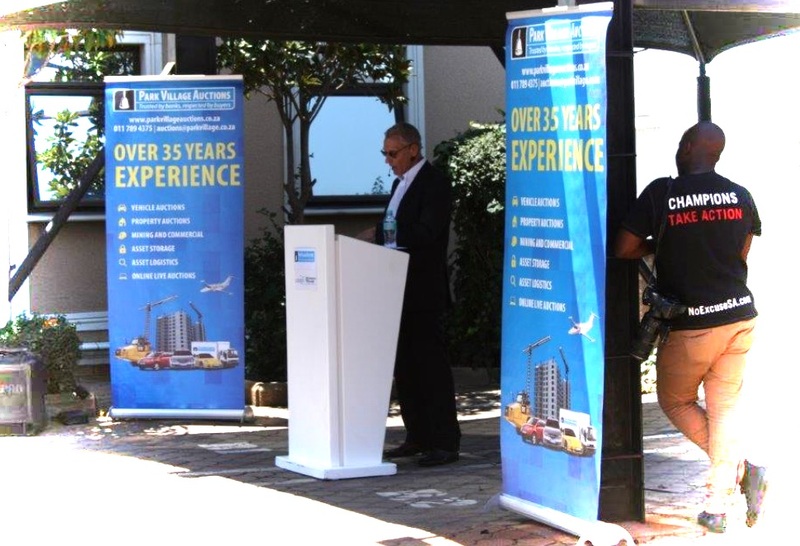 It requires an integrated, multi-faceted blend of business, financial and marketing skills as well as experience, all of which Park Village Auctions possesses in abundance. Backed by 35 years experience, Park Village Auctions is widely regarded as one of the auction industry’s premier auction companies. Since inception, the company has been professionally steered by its directors who, together with their new empowerment partners, continuously strive to take the company to the next level. Over the years we have been active in virtually every sphere of the asset disposal market. We are particularly well known for our car auctions, truck auctions and property auctions and consistently achieve prices which exceed expectations. Our nationwide footprint also gives us – and our clients – the upper hand. We have retained our leading position by raising the bar across every aspect of our business and aim to continue setting the pace in the auction industry for many years to come. Park Village Auctions has been awarded a ‘Level 2’ certificate in terms of the current BBBEE framework. As such, we are now able to render a full range of asset management and disposal services to both the public and private sector. We are also proud members of the Institute of Estate Agents of South Africa (IEASA), the Johannesburg Chamber of Commerce and Industry (JCCI), the National Auctioneers Association (NAA) and the South African Institute of Auctioneers (SAIA). One of the auction industry’s premier auction companies. Park Village Auctions recently opened a new business rescue division which specialists in selling businesses experiencing difficulties. Most businesses sold under this banner simply require a capital injection or restructuring in order to continue operating and therefore represent a great opportunity for investors. Modern, company owned warehouses in every region enable us to store assets on behalf of financial institutions, trustees, liquidators, logistics entities and government departments. In keeping with our forward thinking nature, we recently expanded our services and now offer affordable storage solutions to private individuals and companies alike. Those in need of such services can store their goods securely at our convenient pallet based storage facilities. Regional warehouses, our own modern fleet and the development of an industry leading tracking tool named ‘Synergy’ set us apart. As is to be expected, our asset processing system is also highly sophisticated. Upon submission, all details of an asset are captured, following which it is tracked and allocated to a 24/7 monitored storage area. Our property division specialists in the valuation and disposal of private properties across the spectrum and offers a number of related services. None of our staff members are directly or indirectly connected with liquidators, financial institutions or trustees. Buyers are advised to obtain a sales catalogue and familiarise themselves with the terms and conditions. To avoid misunderstandings, listen carefully to the auctioneer’s description of the vehicle you are interested in. Vehicles must be inspected carefully before bids are made. A registration fee is payable in CASH or BANK GUARANTEED CHEQUE to take part in the auction. All deposits are refundable if the buyer is unsuccessful. If your bid is successful you need to report to the registration office with your number (which is a receipt for your purchase). An invoice is printed stating the amount due. This is subject to your bid not being Subject to Confirmation (STC) –in which case the banks need to confirm or reject the price. STC means your bid has a restriction and the bank needs to confirm your achieved price first. Once this has been confirmed, you can pay for your vehicle. If there was a STC on the asset, Park Village Auctions (PVA) will contact the buyer, once approval is received from the bank. PVA goes out of their way to complete this process as soon as possible. No vehicles are released on auction day. Buyers have two days after the auction to arrange change of ownership, payment and for collection of their car. A documentation fee is payable upon the execution of a successful bid. PVA accepts EFTs, bank guaranteed cheques made out to Park Village Auctions, or cash, which must be deposited into our bank account. Please note that banks charge a 2% cash handling fee. Once the deposit is made, return to the auction site with the stamped bank deposit slip as proof of payment. Finance can be arranged for vehicles. Auctions are also attended by various finance houses. Consult with them to arrange the deal that best suits you. For any inquiries, contact your nearest PVA branch, who will gladly answer your questions. A buyer making the highest accepted bid for a lot shall become the purchaser immediately such lot has been knocked down to him. Should there be any dispute whatsoever over, or in respect of, any lot the auctioneer shall be entitled to settle such dispute at his sole discretion which shall include, but not be limited to, the absolute discretion to re-sell such lot or declare any bidder, the purchaser or re-open the bidding even after the drop of the hammer and even if this has the effect of setting aside a validly concluded first sale. *No party shall have a claim for damages of any nature in the event of the auctioneer settling any dispute. The auctioneer’s decision is final and binding on all the buyers. The auctioneer is not liable in any way for any errors or inaccuracies in the description or identification of goods. All goods are sold “voetstoots”. In making a bid, a bidder shall be deemed to have made him fully acquainted with the goods in the lot for which he bids. All accounts must be paid in cash or by bank guaranteed cheque, forthwith, at the conclusion of each day’s sale, in default of which, the unpaid-for lots may at the auctioneer’s sole discretion be re-sold and the defaulter shall be liable for any shortfall. Ownership of the goods sold vests in the auctioneer’s principal until payment in full has been made. Cheques tendered will not be regarded as payment until actually paid by the drawer bank. All goods are sold exclusive of VAT. The auctioneer’s vendu roll of sale is final and binding on all buyers. The risk in any goods sold, shall pass to the purchaser immediately such goods have been knocked down to the purchaser. The purchaser acknowledges that the auctioneer is not liable in any way for any damage to, or shortfall in, the goods or any goods stolen or destroyed before the purchaser takes delivery of the purchased goods. Should the purchaser not comply with any of these conditions, the auctioneer shall in addition to any other damages, be entitled to recover from such purchaser, any loss arising from the re-sale of any goods, together with the charges and expenses in respect of both sales and any deposit held by the auctioneer, shall be forfeited as “roukoop.”The signatory below shall be deemed to have bound himself to the auctioneer as surety and co-principal debtor waiving the benefits of exclusion and division in solidium with the purchaser, for the due performance of all the purchaser’s obligations in terms hereof. The purchaser hereby agrees to pay costs on the scale as between attorney and client in the event of any litigation and consents to the jurisdiction of the Magistrate’s Court, in terms of Section 45 of Act 32 of 1944, as amended but acknowledges that it is in the sole discretion of the auctioneer to institute action in the High Court. No variation of this contract, novation or consensual cancellation or any waiver of any portion hereof shall be of any force or effect unless reduced to writing and signed by both parties. No member of staff has any rights whatsoever to make representation on behalf of the Company OR, to bind the company in any way whatsoever, unless such representation is agreed to in writing and signed, by one of the Members of the Close Corporation. No warranties or representations whatsoever shall be of any force or effect or binding on the auctioneer unless given in writing and signed by a member of the Close Corporation. All goods sold are specifically sold without any warranties whatsoever. Each term and condition contained herein is severable. In the event that any term hereof is found by a Court of Competent jurisdiction to the unenforceable for any reason, the remainder of the terms shall continue to apply and be of full force and effect.